A very warm welcome to fellow author, Carmel McMurdo Audsley. Carmel shares my love of Scotland. She very kindly agreed to take time out of her day to share a little of her family history and why she decided to use Scotland as the setting for her three novels. When I retired from full-time work, one of the projects that I finally had time to work on was tracing my Scottish family history. My father was a Scot and I had always been curious to find out about the people who came before us. I uncovered a lot of information that deeply affected me. I gathered names, dates and places, but it was the people themselves that I wanted to get to know – how they lived and what they felt.I knew where they lived and worked, when their children were born and how and when they died. Some days I would be in tears when I’d find another death certificate, especially child after child. Armed with all the information I’d uncovered, my husband Iain and I visited Scotland again in 2010 and walked in the footsteps of our ancestors, visiting graveyards and trying to find some of the places they had lived. We read so many dry statistics about life in another century, but there are few personal accounts of how people coped on a day-to-day basis. I wanted to write books based on fact but full of emotion, so that the reader would be drawn into the story and get a feel for what was happening at that time. From the information I uncovered about my family, all the way back to the mid-1600s, I knew that there was a great story to be told. In fact, I had enough material for three books, and all of them have now been published. Everyone’s family history is a gold mine of stories. The way my family lived – first as agricultural labourers then as coal miners – is the way many people of the time lived. The books bring the characters to life and many readers have told me that they fill in a lot of blanks in their own family history. Readers have really connected with the family members, laughed with them and cried with them. One reader told me that she could ‘smell the smoke from the peat fire and the tallow candles in the little cottage’. From the green farm lands of Durisdeer (Faeries, Farms and Folk) to the bleak miners’ rows of Muirkirk (Ours, Yours and Mines) and the death of children from tuberculosis, through two world wars and the Great Depression we follow the family as the path leads to Australia (Far Across The Sea). Carmel McMurdo Audsley is an Australian Journalist, Editor and Author who lives in Brisbane with her husband Iain. They both had Scottish fathers, share a mutual love of Scotland and have walked in the footsteps of their ancestors in the country that they love to visit. 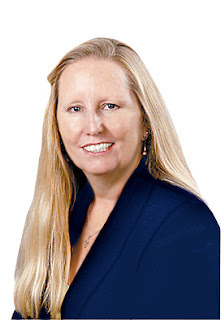 As a Newspaper Journalist and Magazine Editor, Carmel has written, and had published, thousands of news stories and feature articles and has now turned her research and writing skills to digging up the past and breathing life into the characters she finds. Her first historical fiction novel, Ours, Yours and Mines, about the mining families of Ayrshire Scotland, was published in 2012 and captured the hearts of readers as the story unfolded about the harsh living conditions in the mid-1800s and the sad loss of life. Far Across The Sea continued the story with a young man from Scotland travelling to the sunny shores of Australia. Carmel’s third book, Faeries, Farms and Folk, details the lives of farming folk in the south-west of Scotland who were uprooted from their ancestral homes at the time of the industrial revolution. 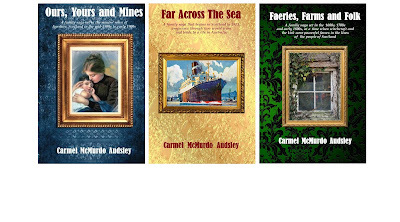 The books are all based on Carmel’s family history. She now devotes all her writing and editing time to producing Scots News Magazine for ex-pat Scots in Australia, and researching and writing historical fiction.